There's an old barn on Snickersville Turnpike just outside of the blink-and-you'll-miss-it town of Airmont. It sits up on a rise way back from the road and slowly falls into decay. Surrounding it, scattered throughout the corn fields now gone fallow, are the surveyor stakes and orange plastic netting signifying tract mansions on the way. 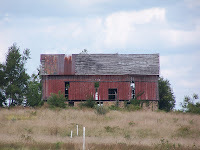 I've often thought the barn beautiful, despite its sad state, and stopped the other day to take its picture. It's fortunate that I did because ironically two days later, the barn was simply gone. The wind may have toppled it but I suspect a bulldozer brought it down. The rise now is completely empty, which mirrors the feeling in my heart when I drive by. It was an important part of Place to me.